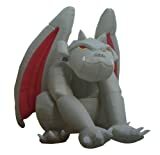 This Halloween, go medievally obnoxious with your decorations when you let this this cool new Gargantuan Inflatable Gargoyle guard your front lawn. 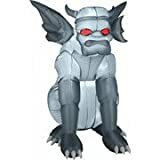 This massive gothic gargoyle towers 15 feet in height, sways its huge 3 foot head back and forth looking for victims and illuminates from the inside to ensure the overblown decorative terror continues day or night. 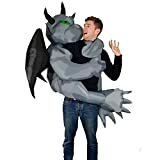 Way more sinister and attention-grabbing than some goofy carved pumpkins.